Limani hotels in Çanakkale and Bozcaada are run by the Yalman family. The group was founded by Hüseyin Yalman and all members of his family are involved in their operation. Hüseyin is the overseer and commander-in chief. His wife Hülya, active in various local organizations, may be found schmoozing with ladies’ groups in Cafe du Port in the afternoon. His elder son Orkun, manager of the IVECO dealership and second-hand car showroom, hobnobs with businessmen and buddies over a glass of amber nectar at the bar in the evenings. His younger son Akın is le manager of “Otel Limani” on the island of Bozcaada (Tenedos), the sister hotel of “Çanakkale Limani”. Orkun’s wife Dilara became the proud mother of a baby boy, given the name Hüseyin Batı (“HB” for short) in May 2011. That makes six Yalman’s (so far). Hüseyin Yalman was born in Gelibolu (Gallipoli) in 1955, the grandson of immigrants from Macedonia in Greece and the son of a truck driver who started the first bus company operating the route from Istanbul to Çanakkale-Edremit. Hüseyin’s induction into the world of business was as a nipper selling simit on the streets of Gelibolu in the school holidays and polishing shoes in Istanbul. Following graduation from Agricultural College, he gave up tending peach trees after a few years to open his own shop selling spare parts for Ford lorries. He then became the official distributor for IVECO vehicles (trucks and minibuses) in the region and set up a showroom and service center. As a member of Çanakkale Businessmen’s’ Association (ÇASIAD), he has made many trips to Europe and also several to Australia to brush up his already-fluent English and see what his sons were up to. Orkun went to Italy to learn Italian before hoofing it down-under to learn Australian English in Sydney. Akin studied advertising, marketing and haute cuisine in Sydney. Hüseyin Yalman is a former President of Çanakkale Businessmen’s Association. 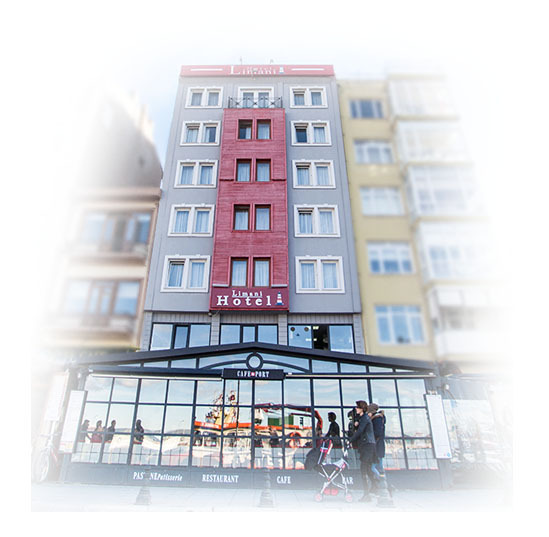 Hotel Limani is situated on the waterfront of Canakkale city on the Dardanelles Straits between Troy and Gallipoli.